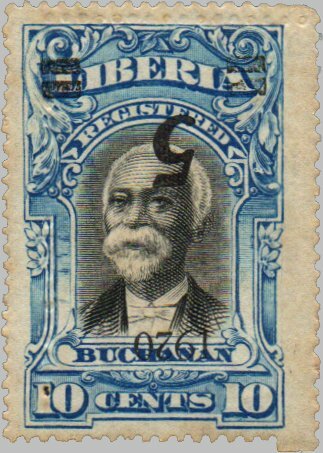 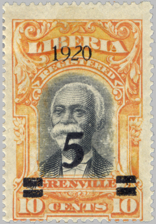 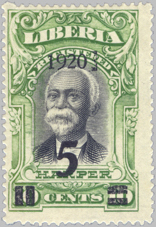 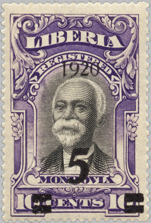 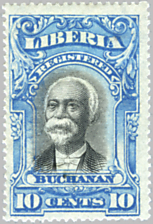 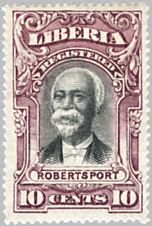 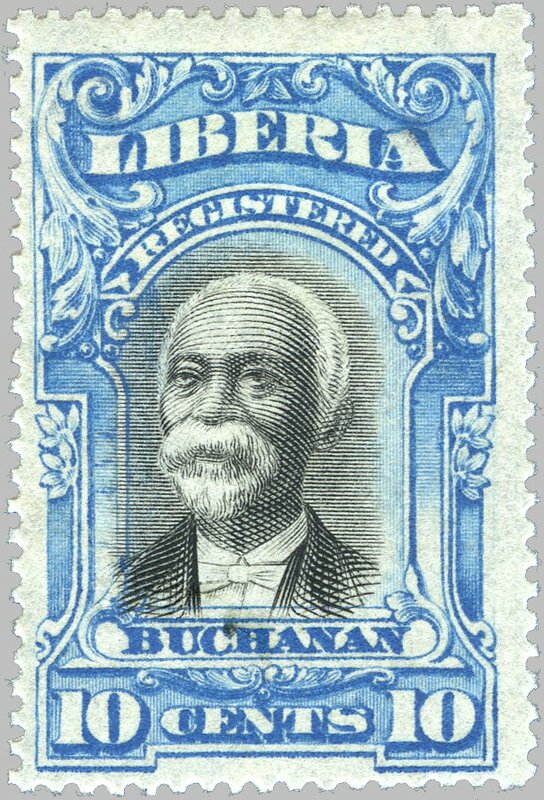 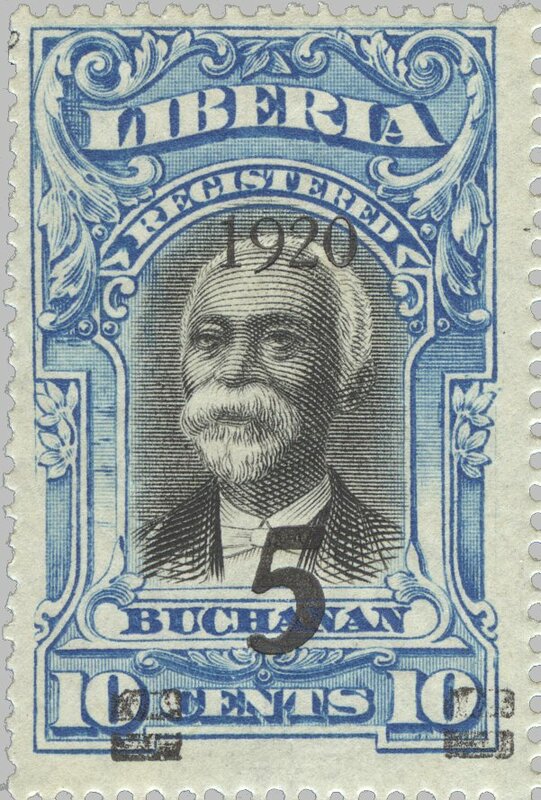 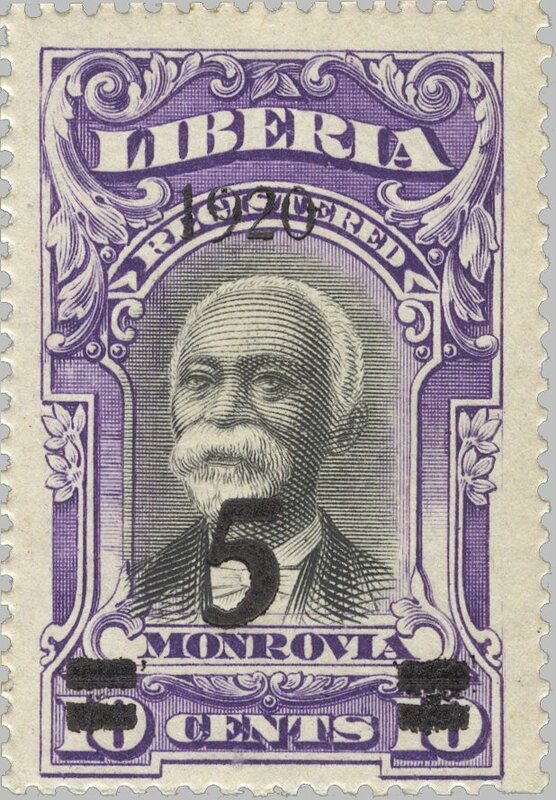 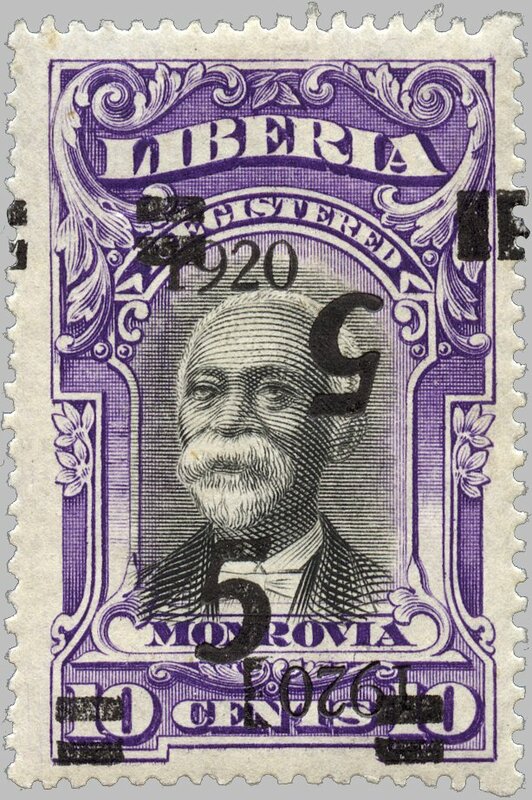 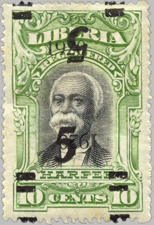 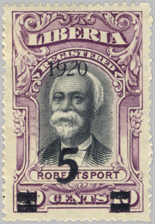 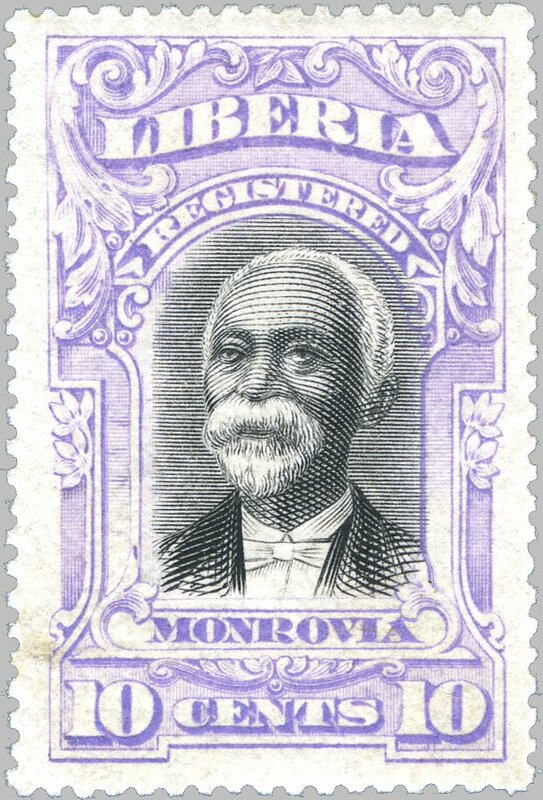 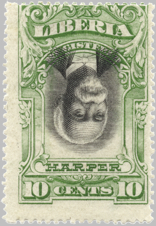 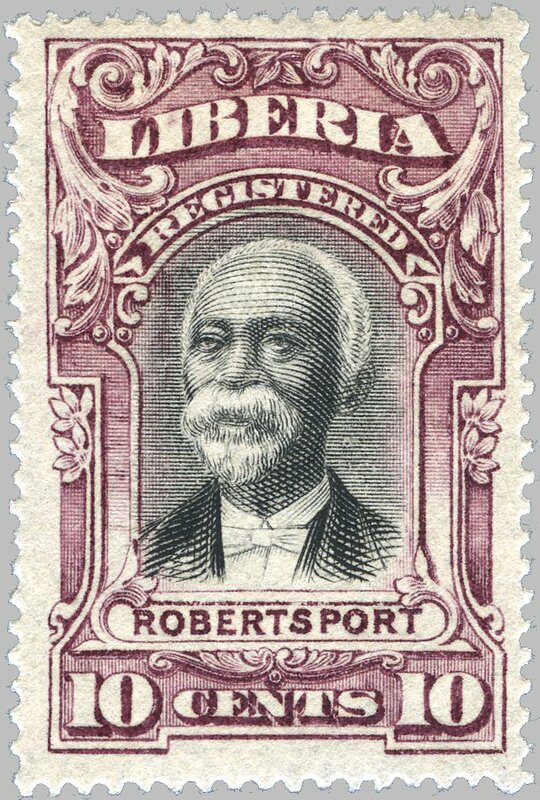 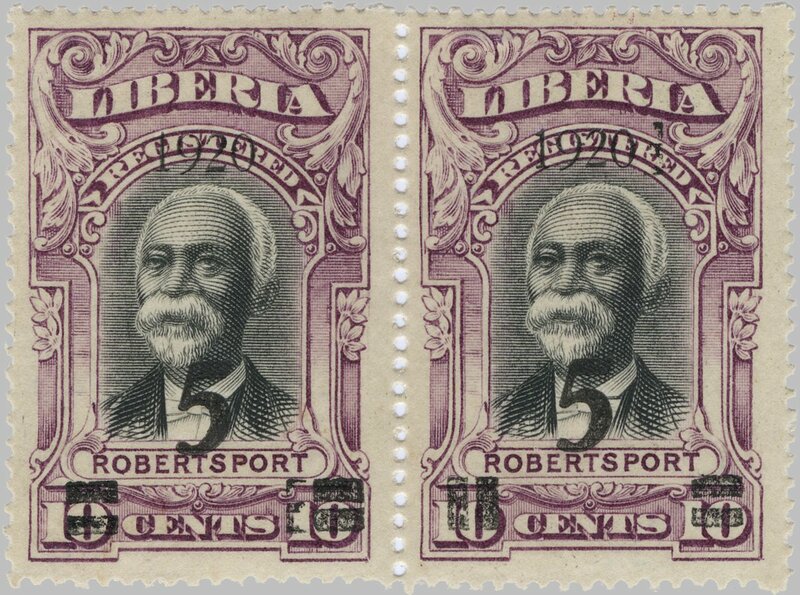 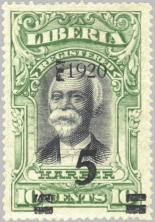 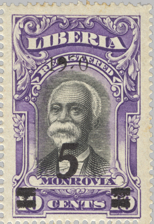 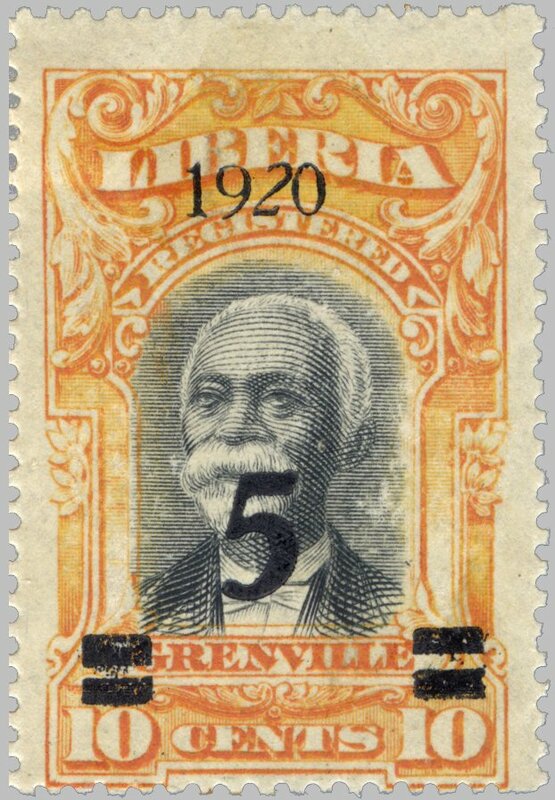 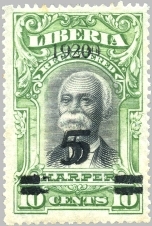 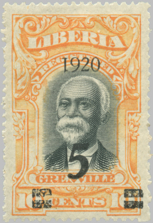 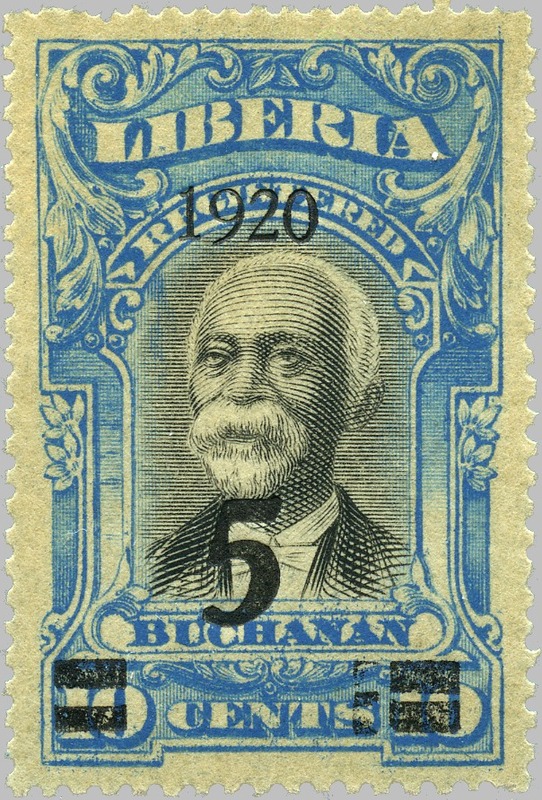 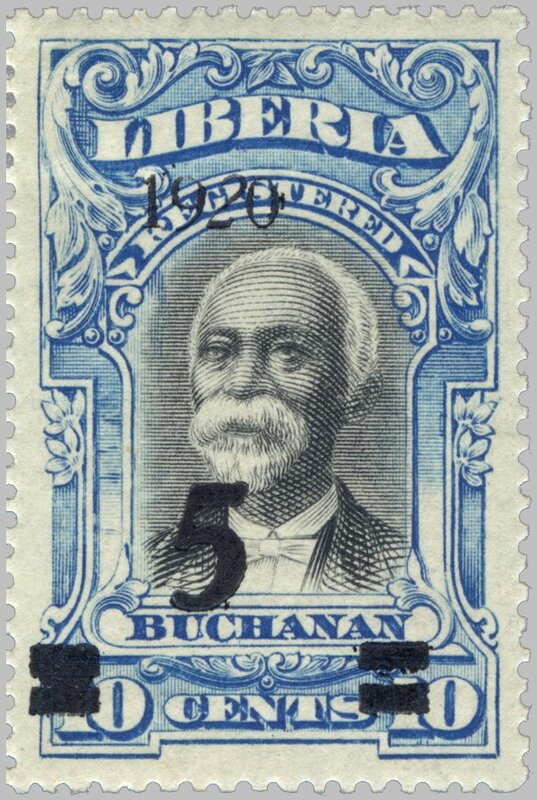 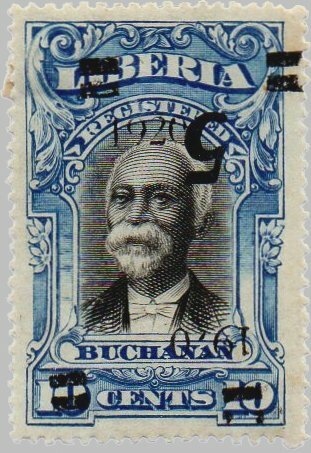 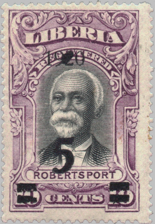 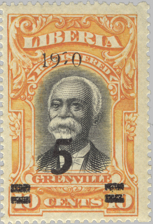 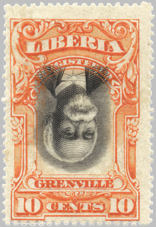 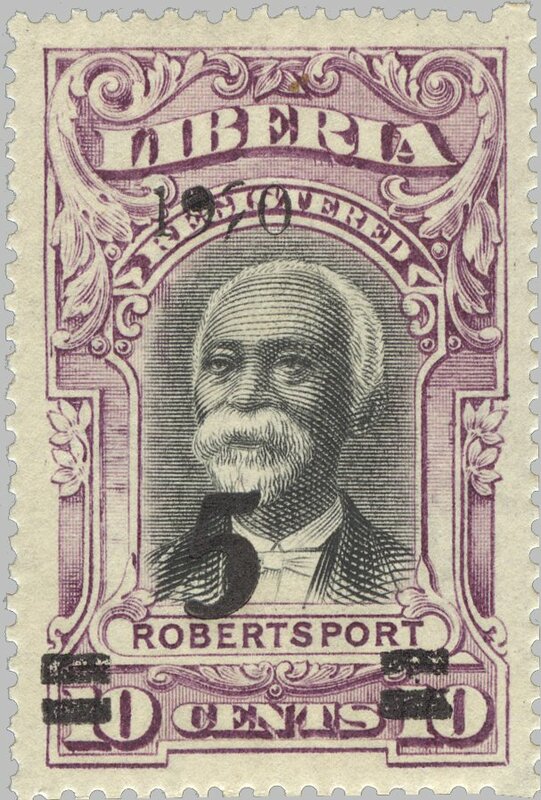 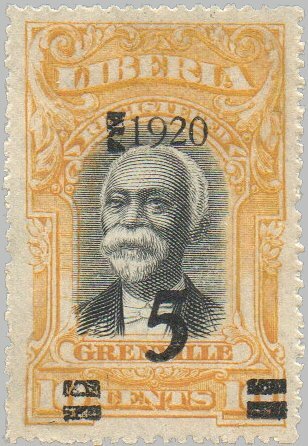 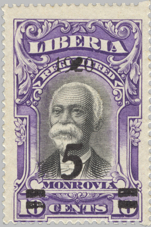 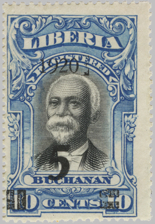 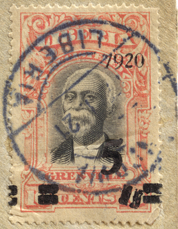 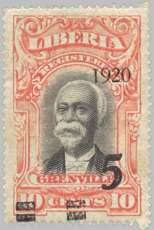 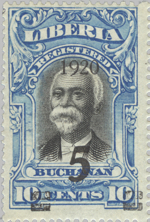 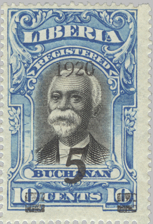 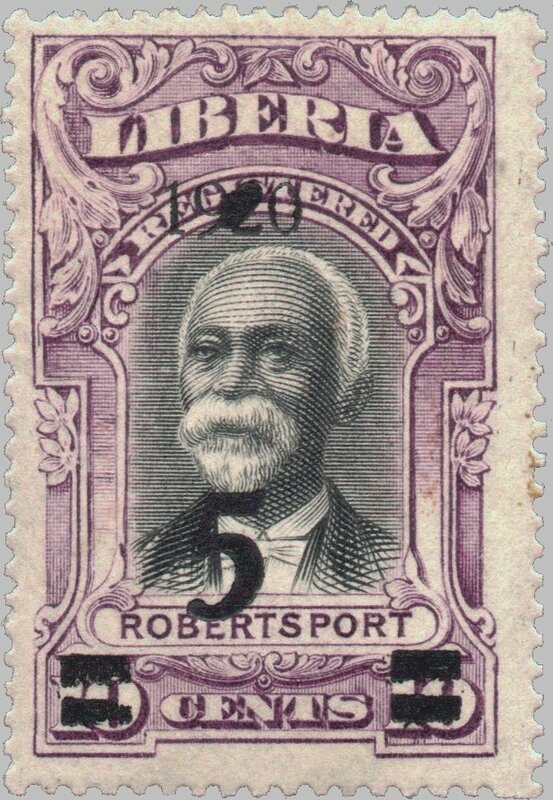 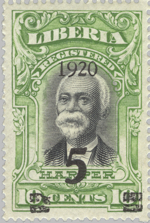 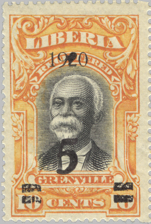 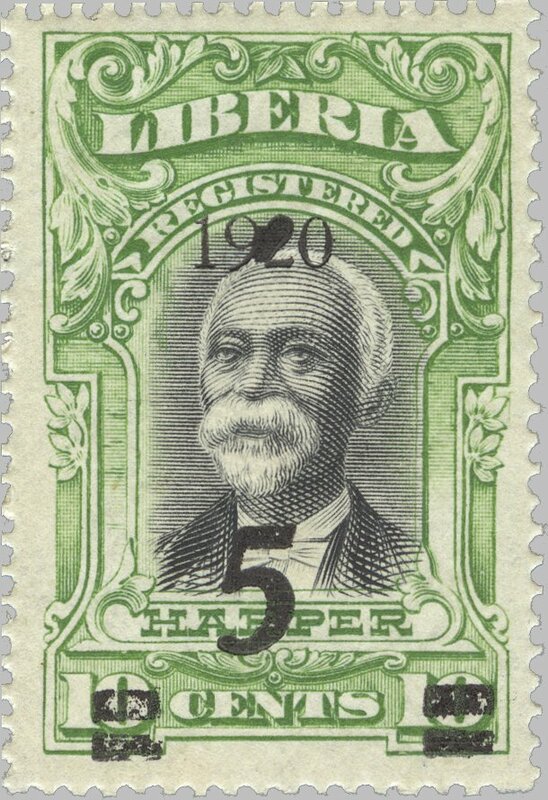 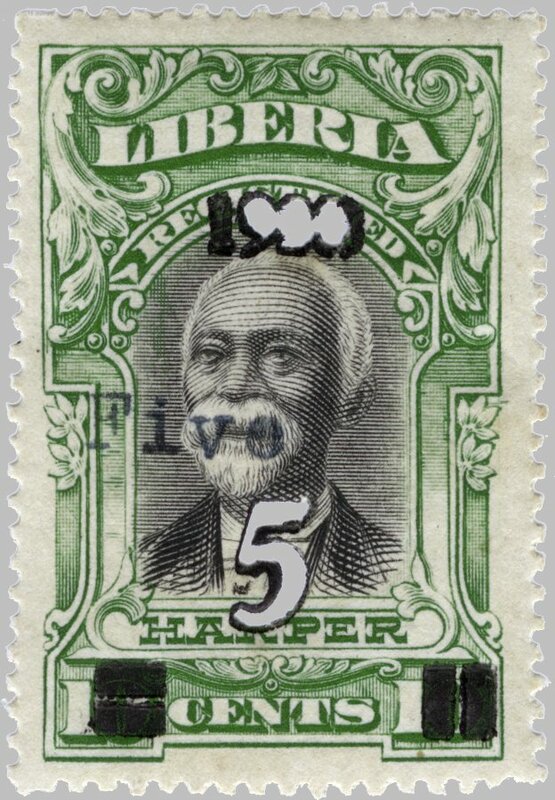 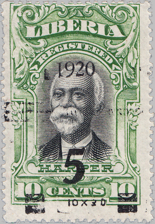 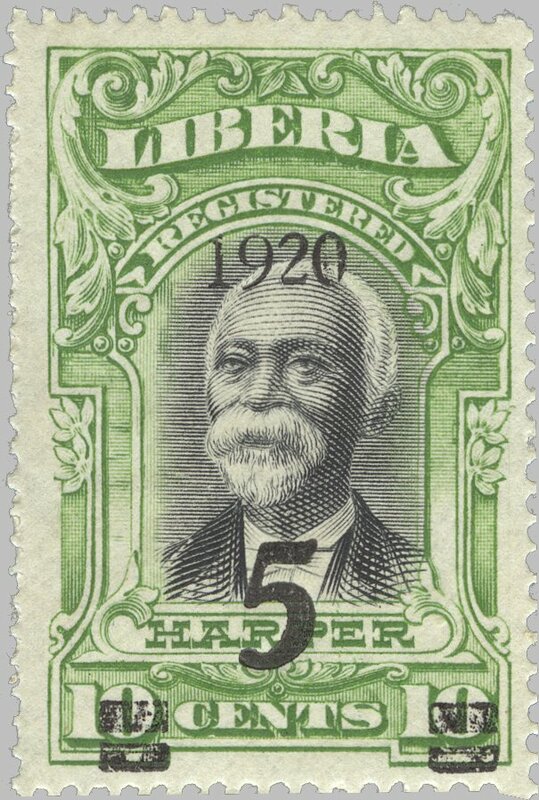 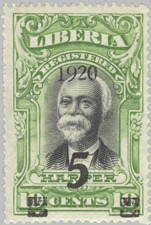 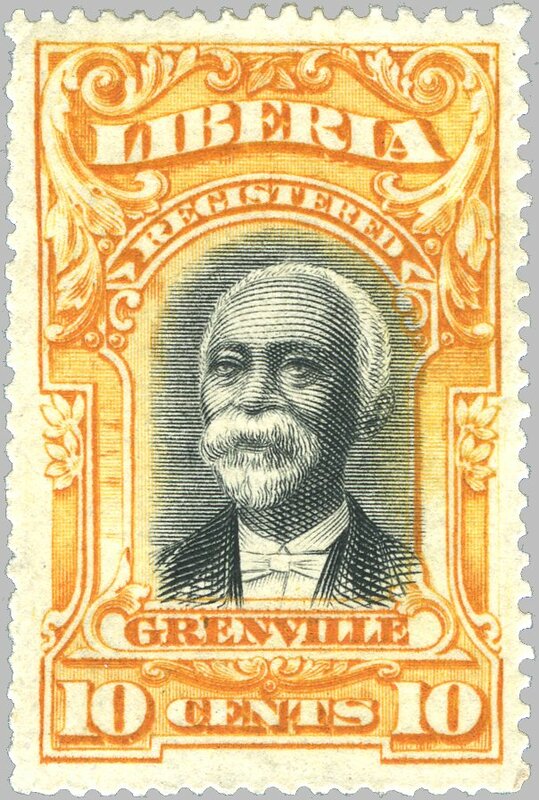 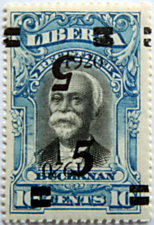 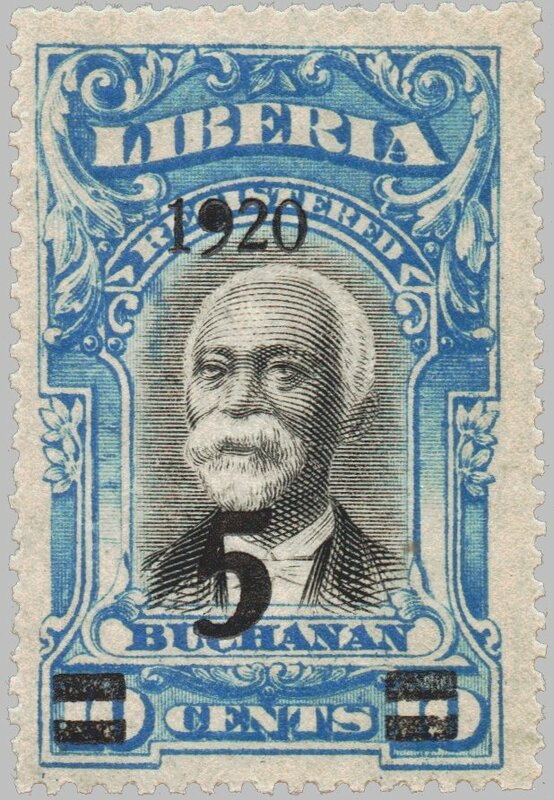 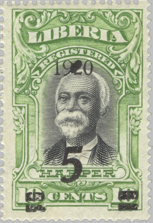 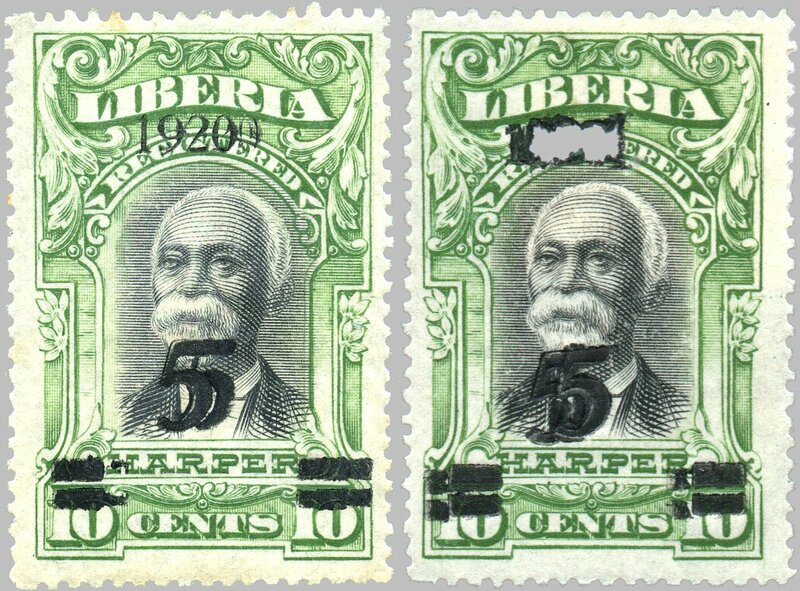 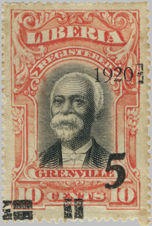 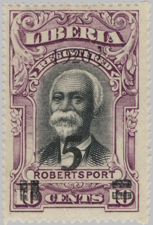 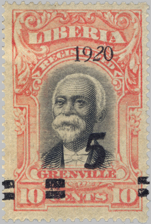 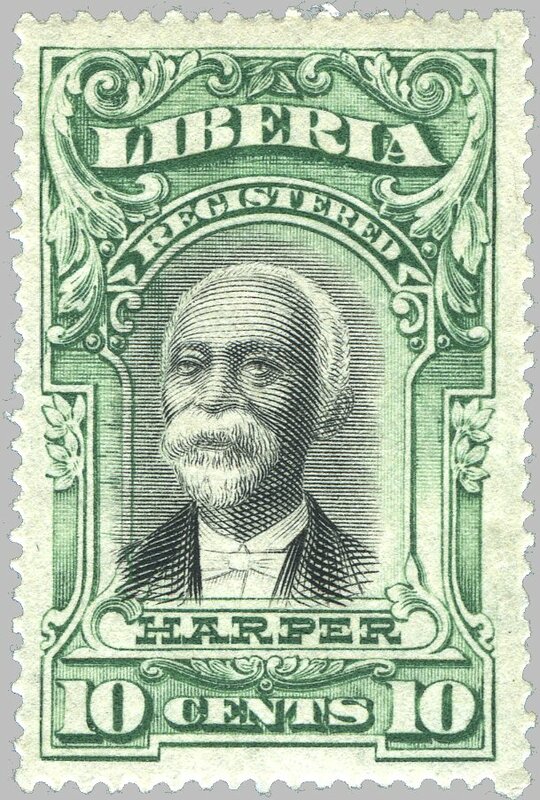 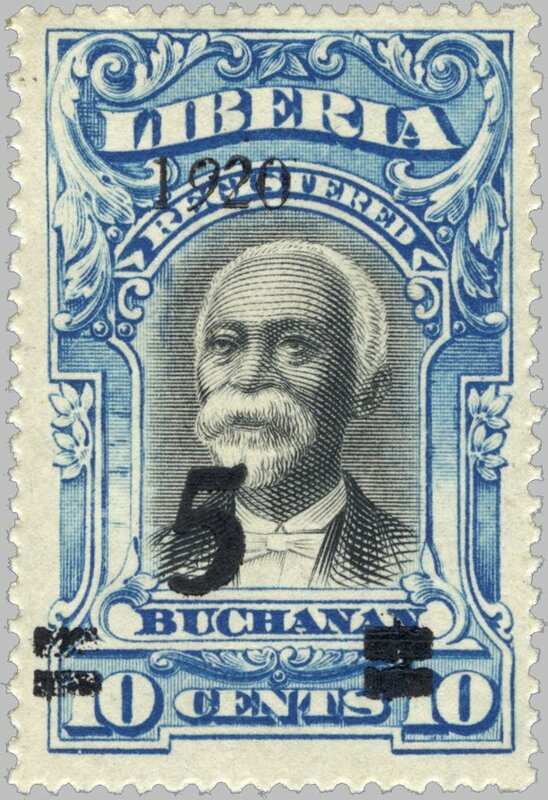 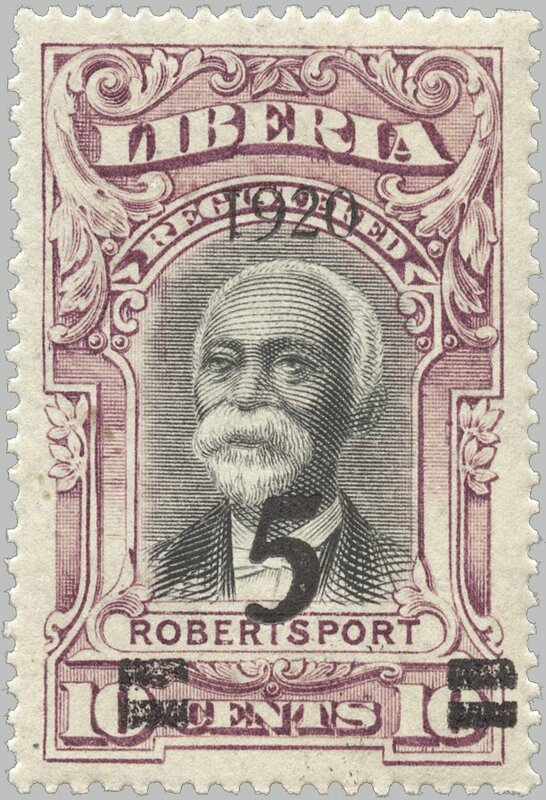 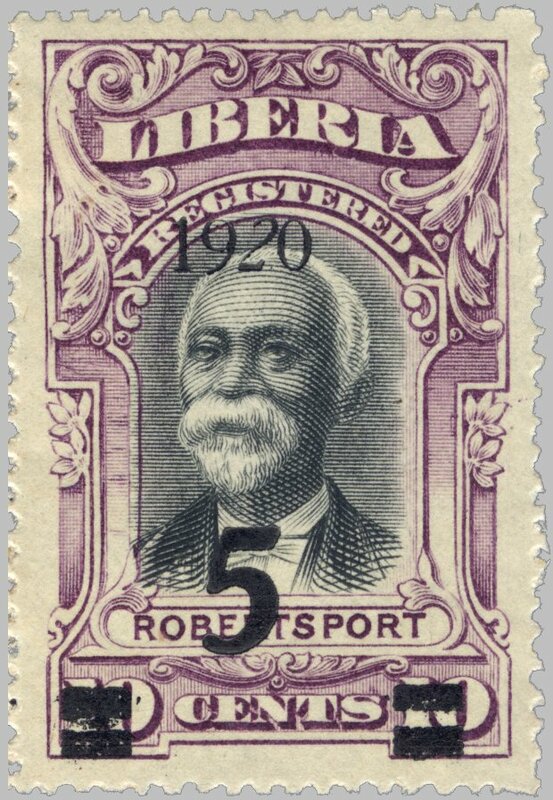 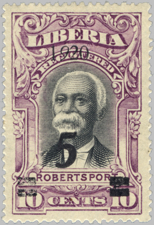 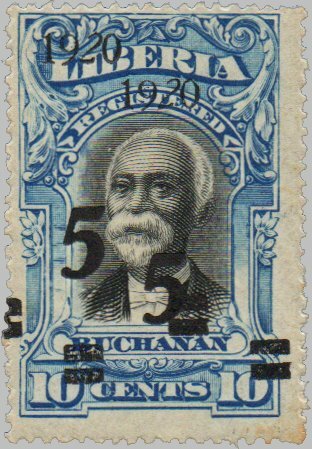 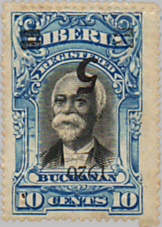 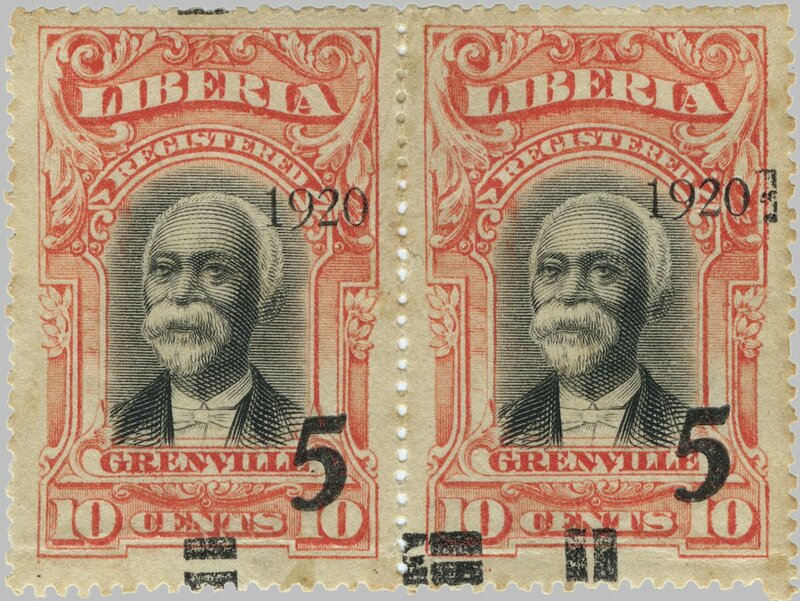 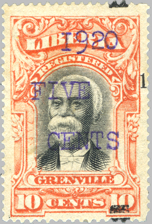 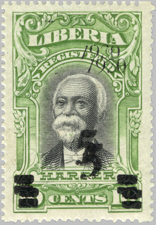 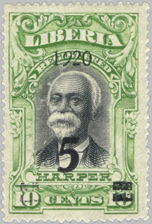 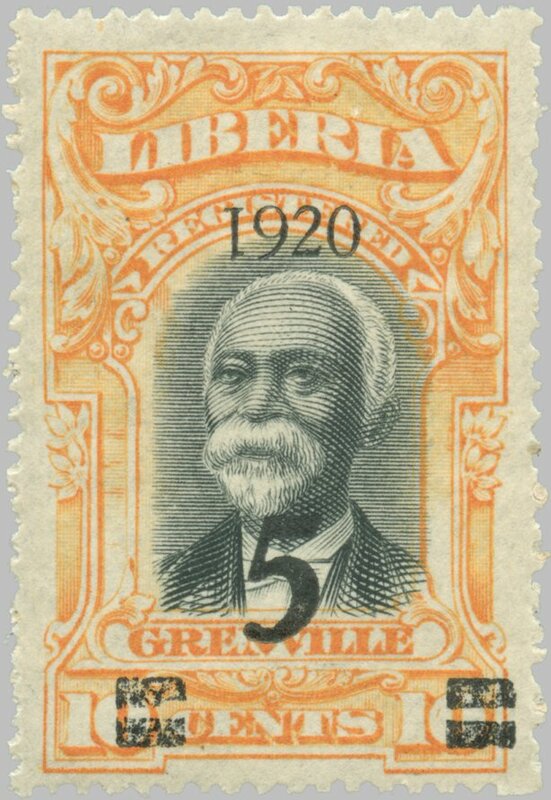 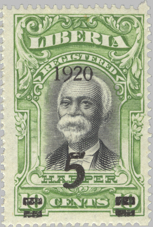 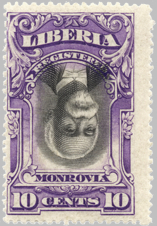 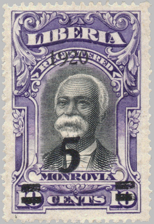 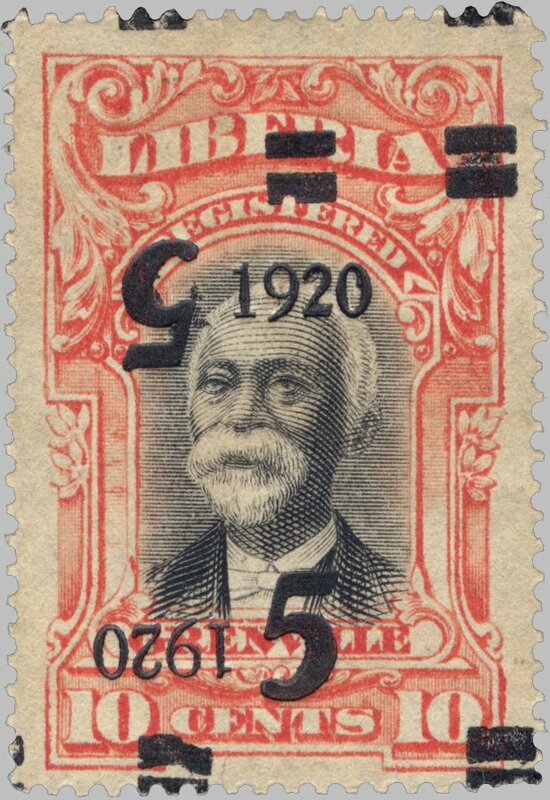 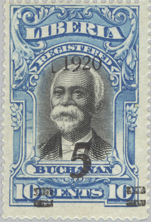 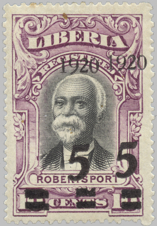 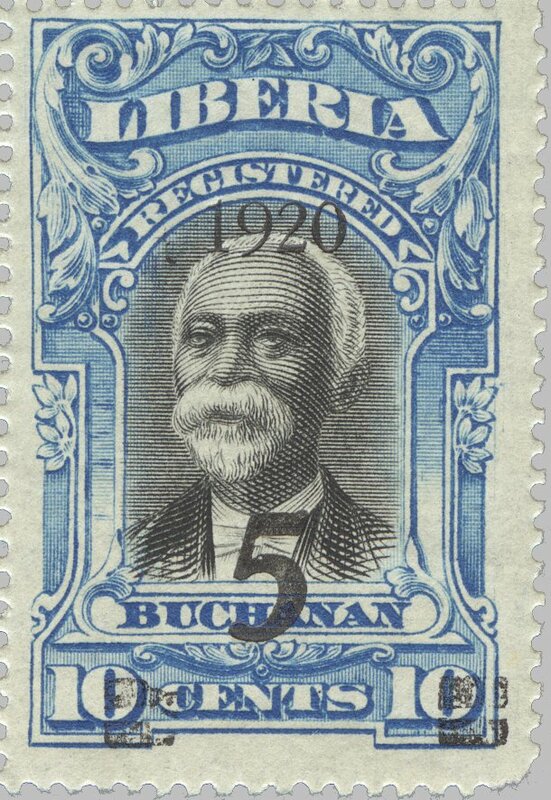 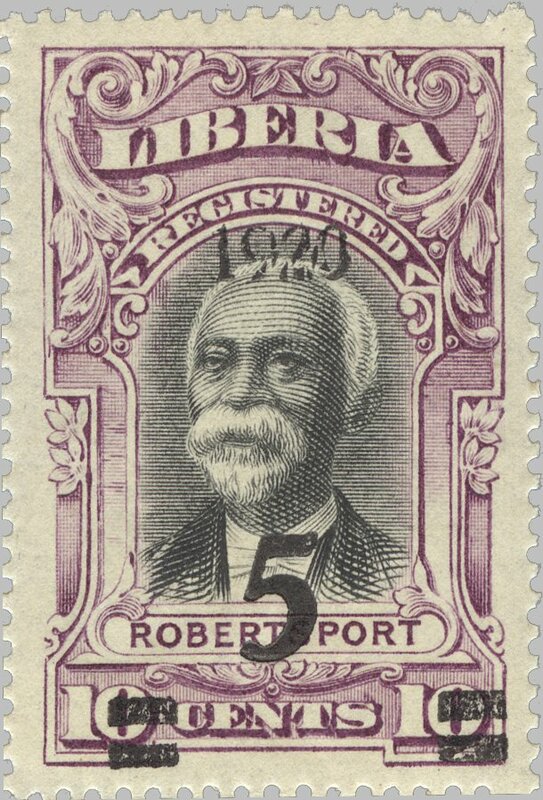 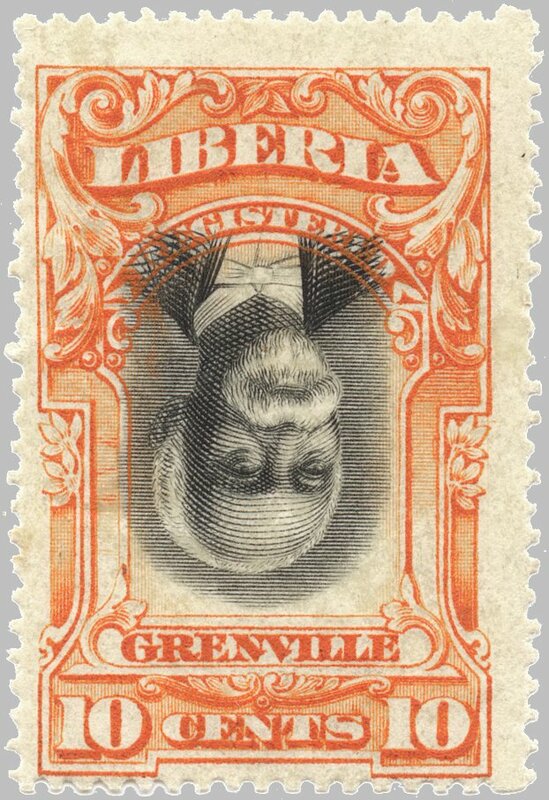 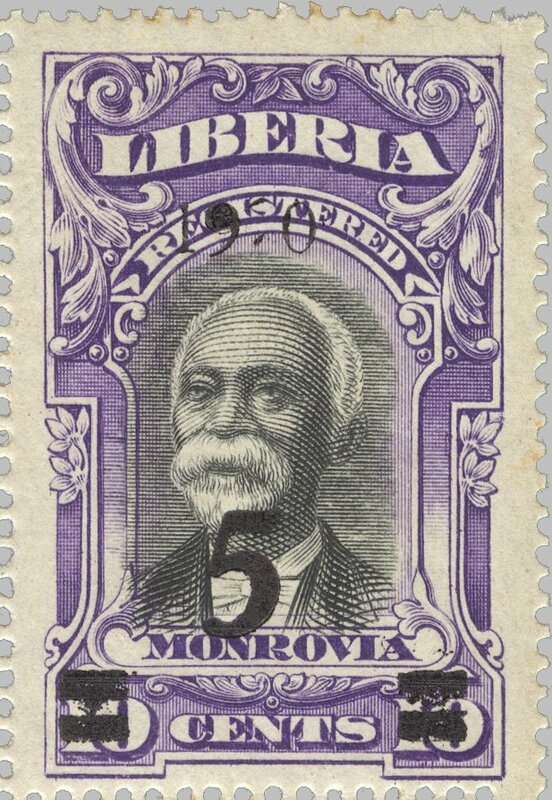 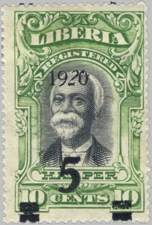 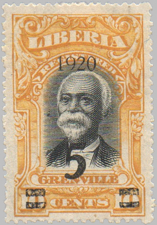 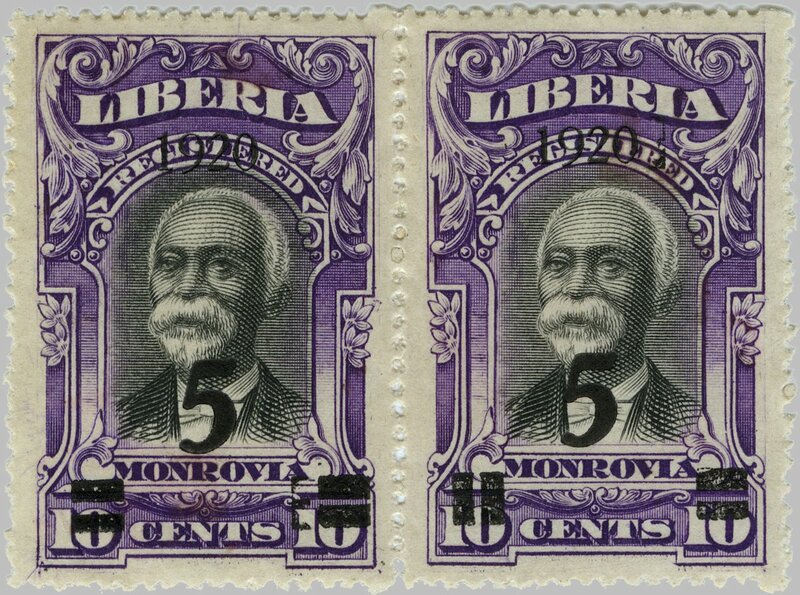 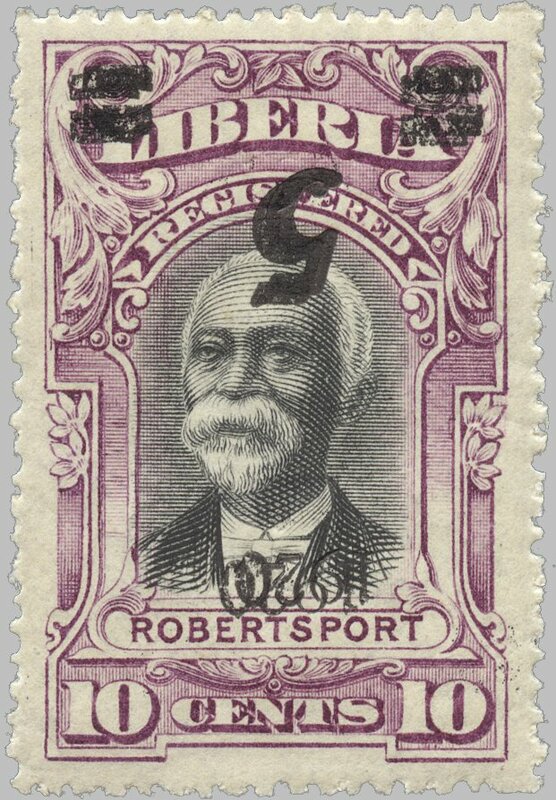 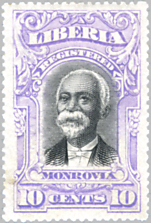 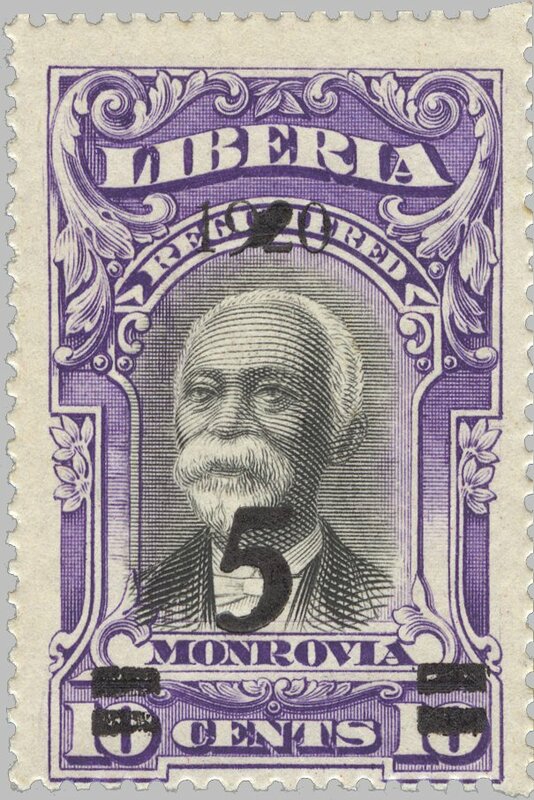 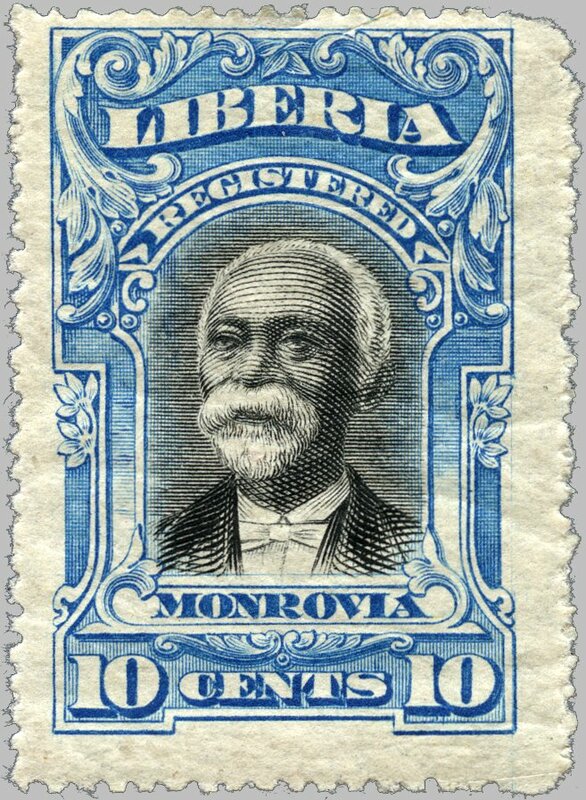 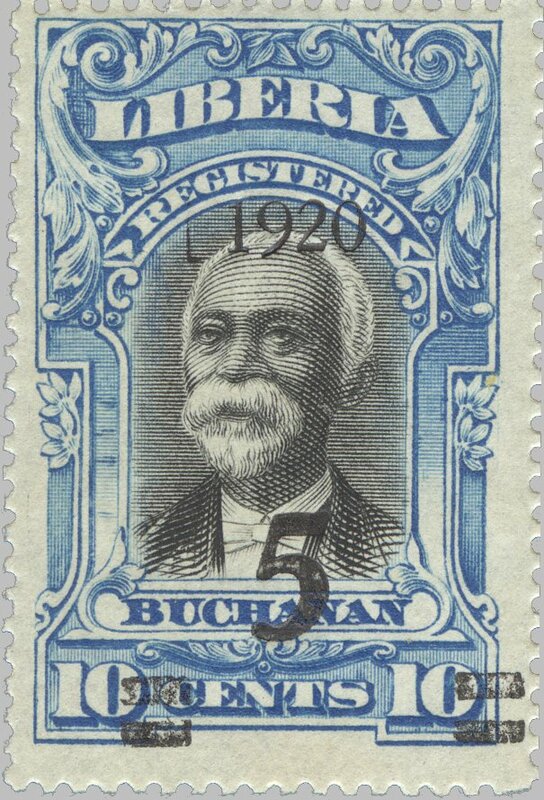 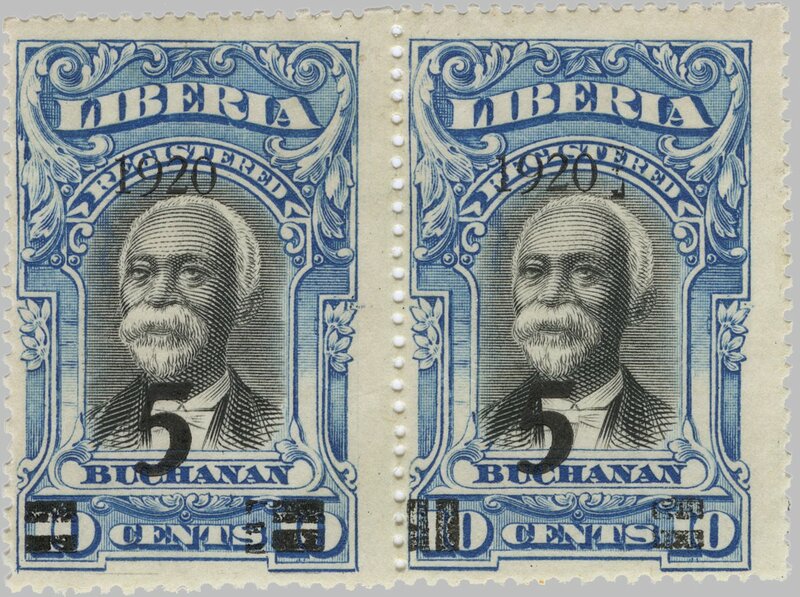 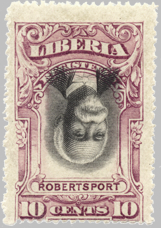 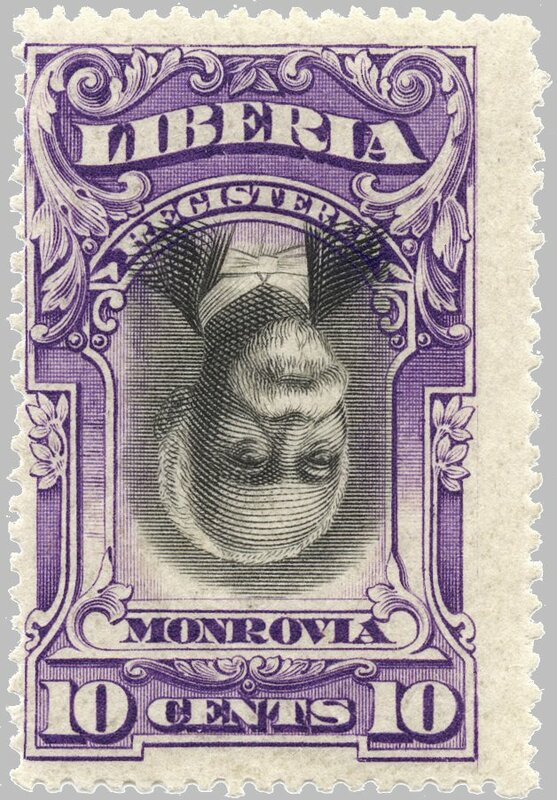 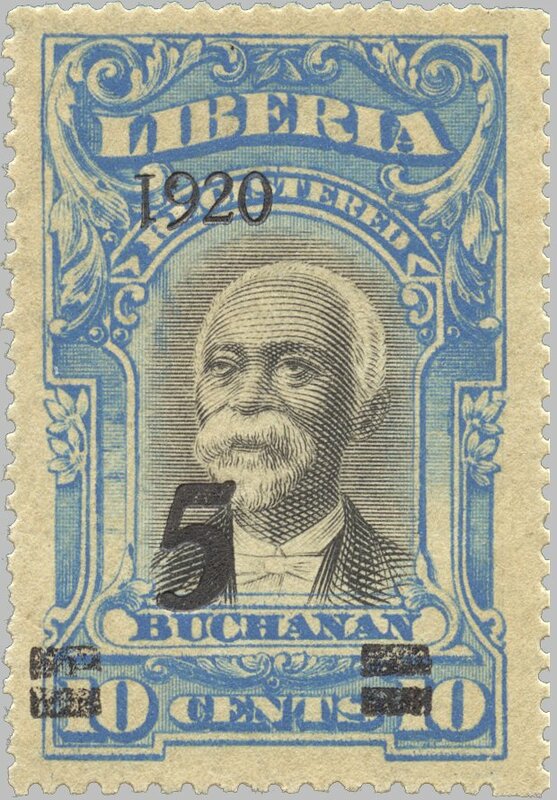 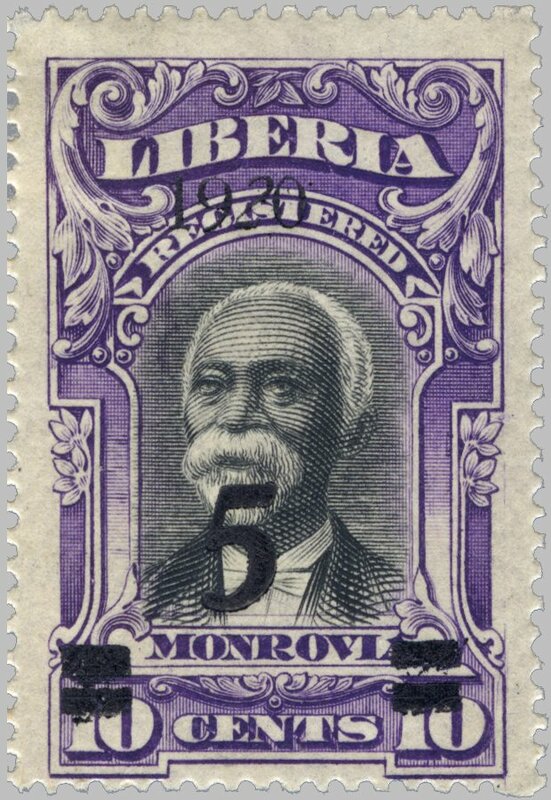 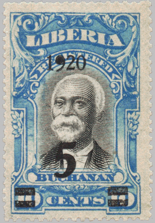 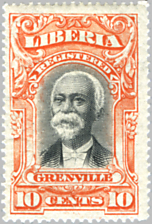 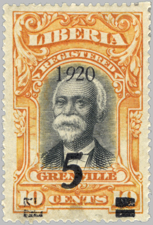 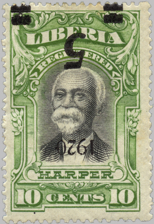 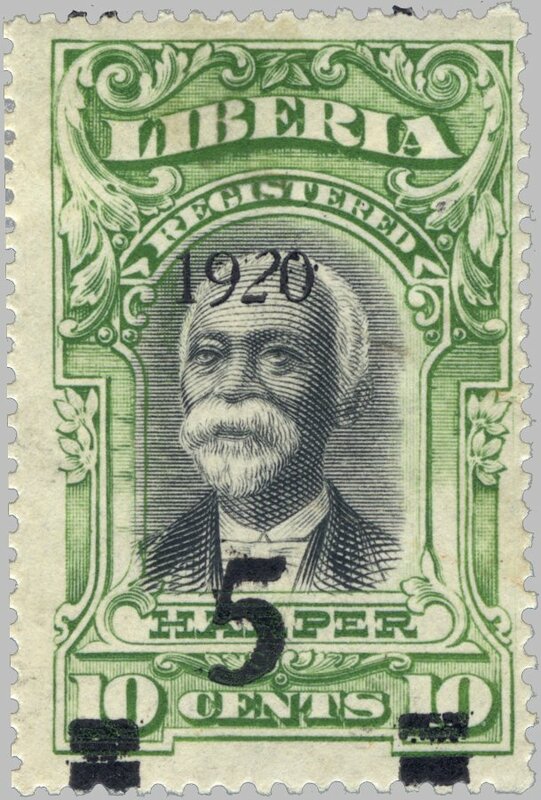 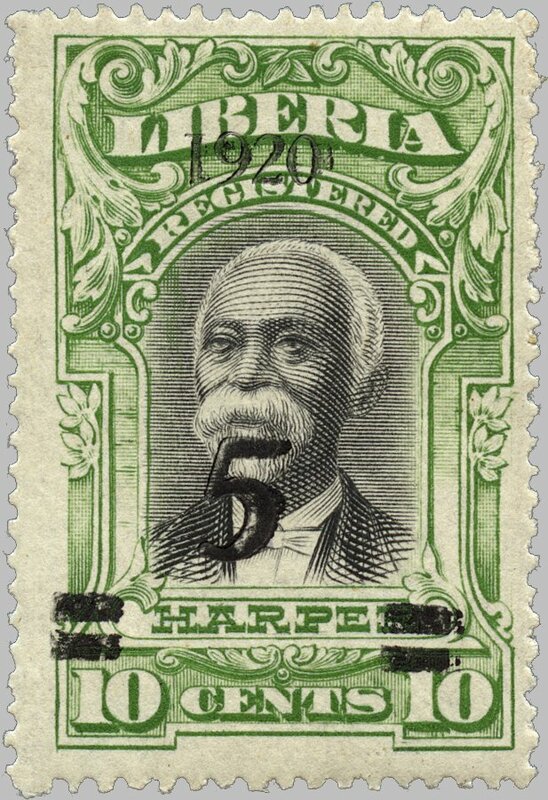 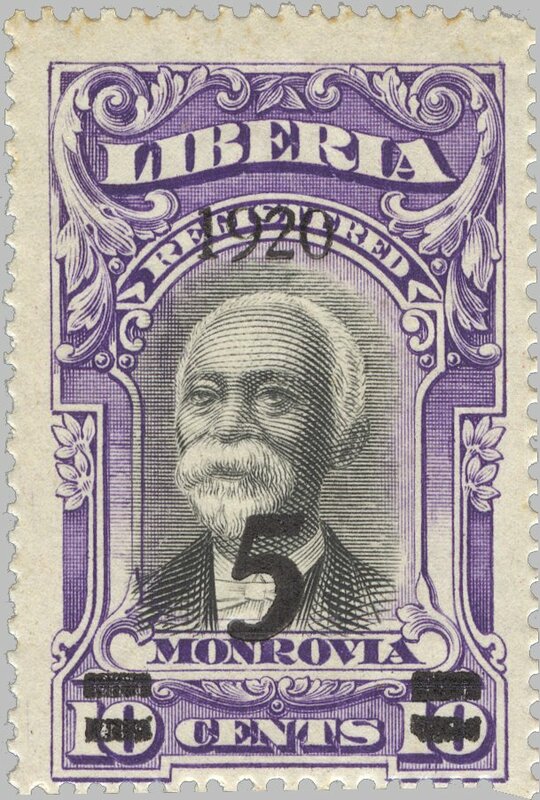 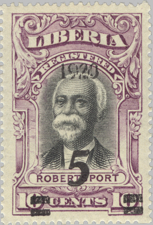 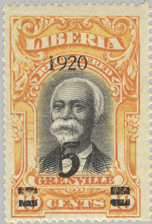 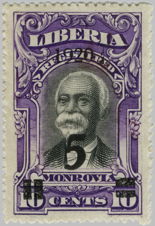 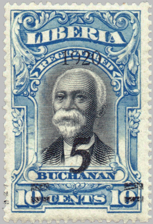 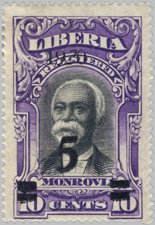 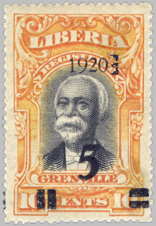 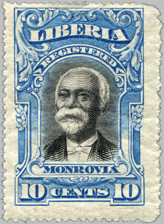 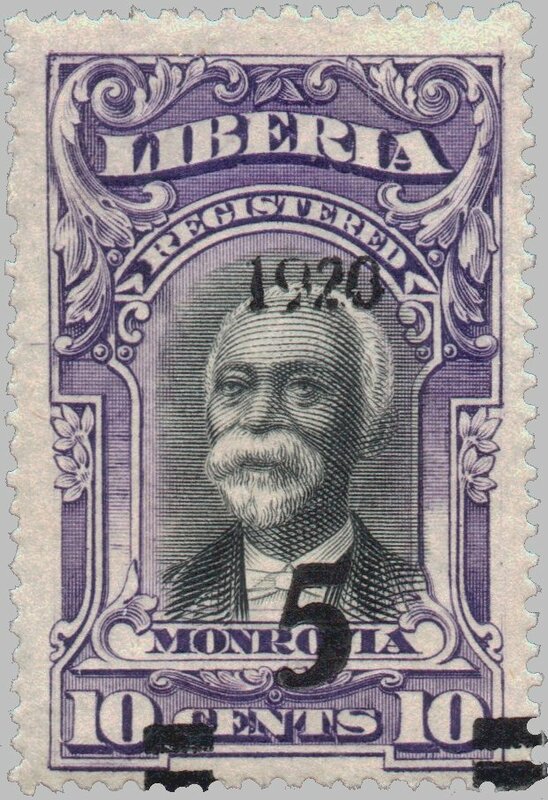 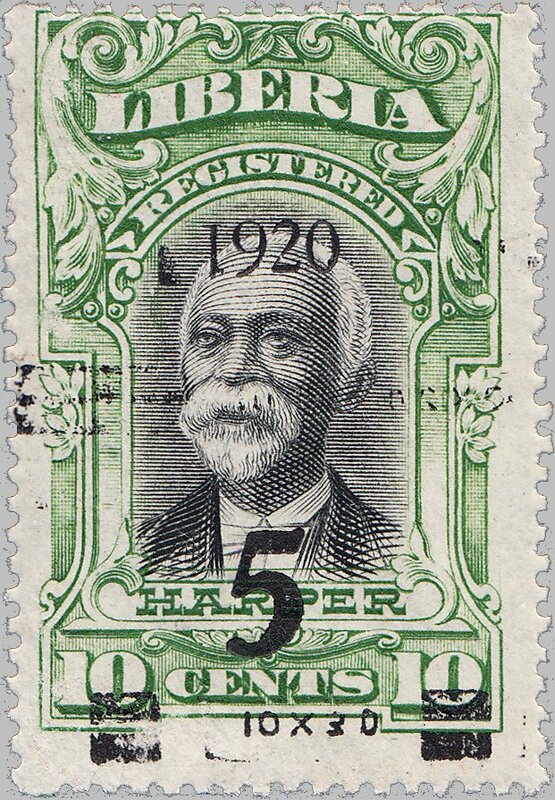 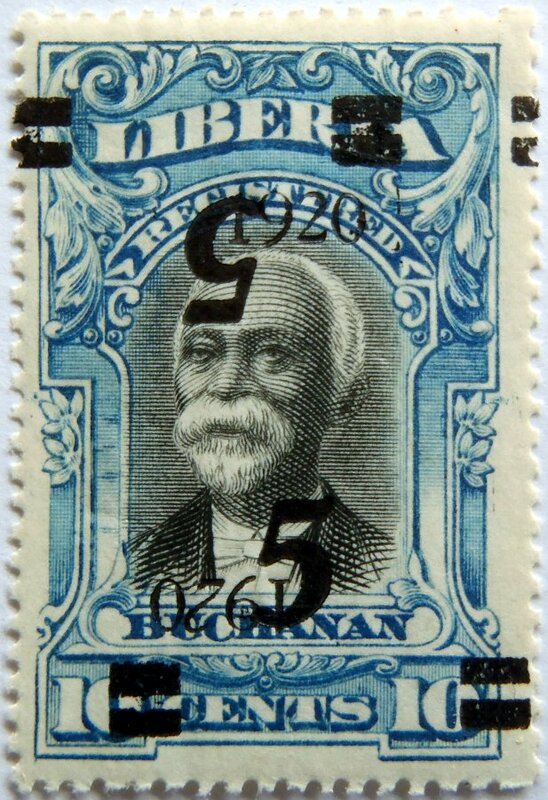 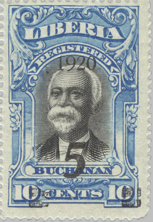 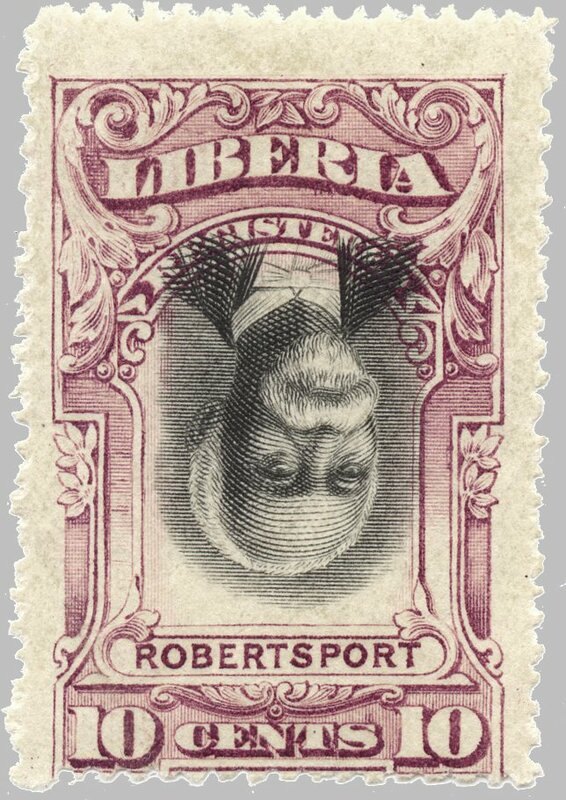 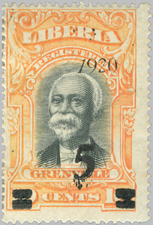 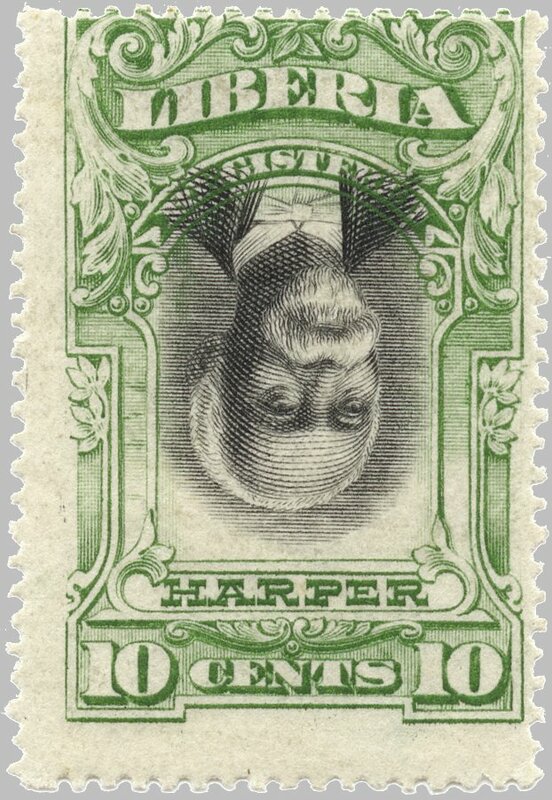 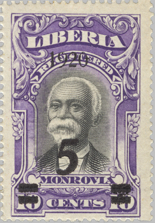 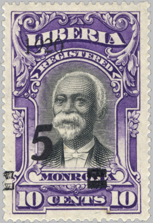 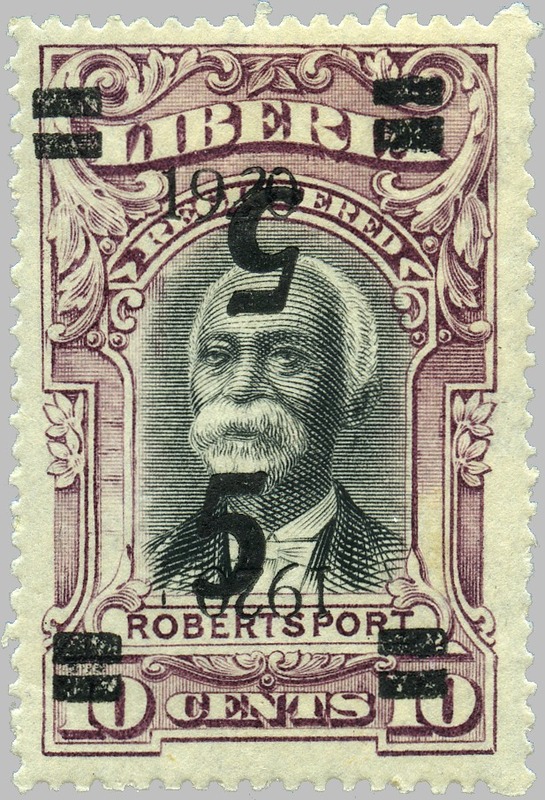 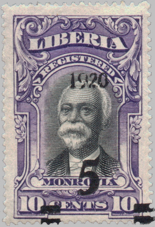 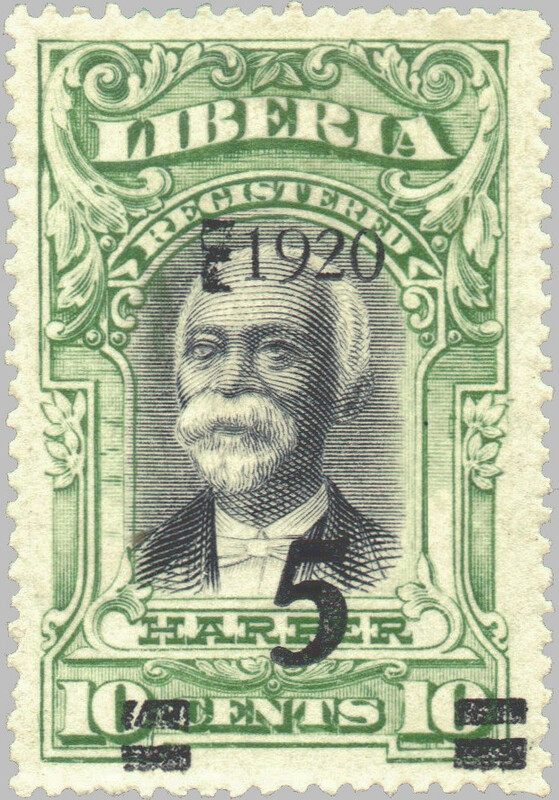 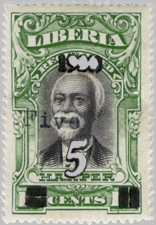 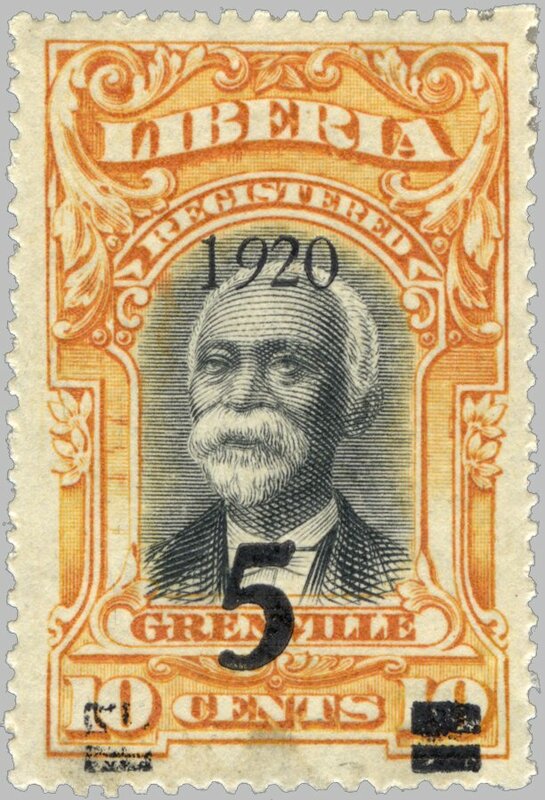 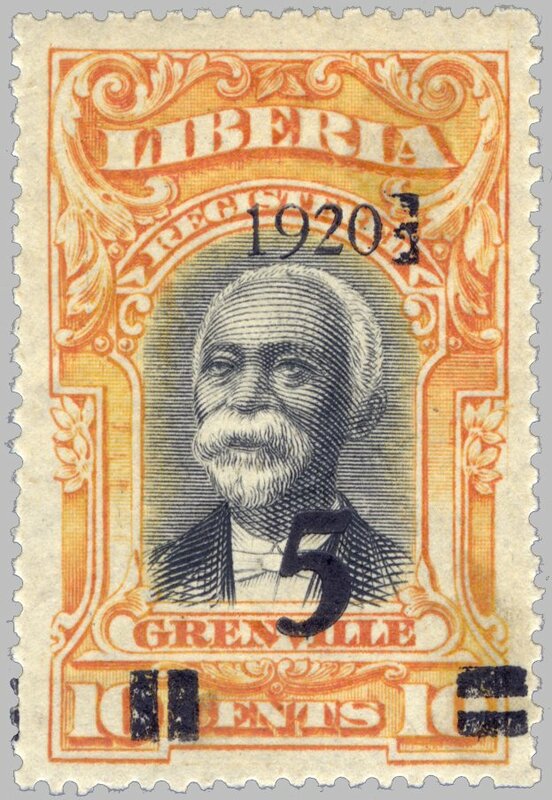 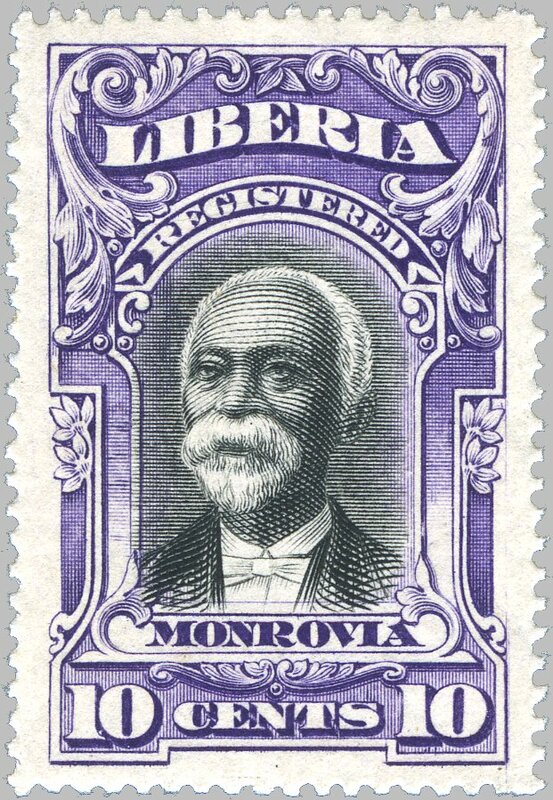 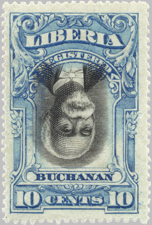 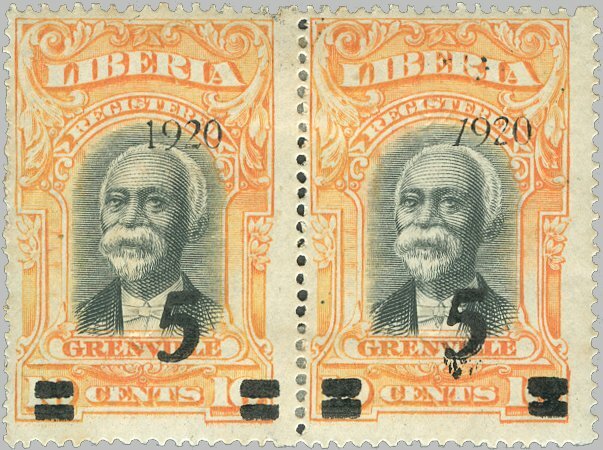 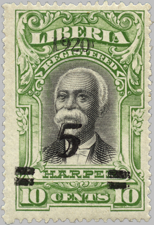 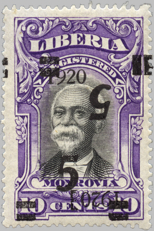 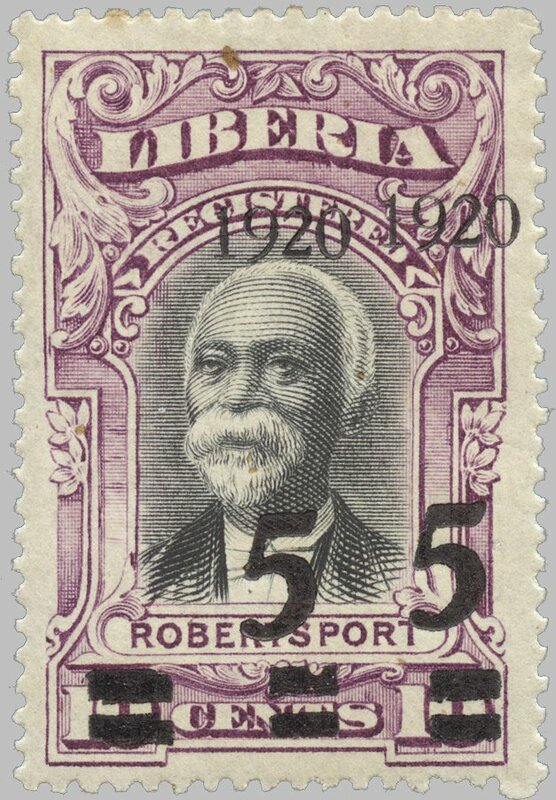 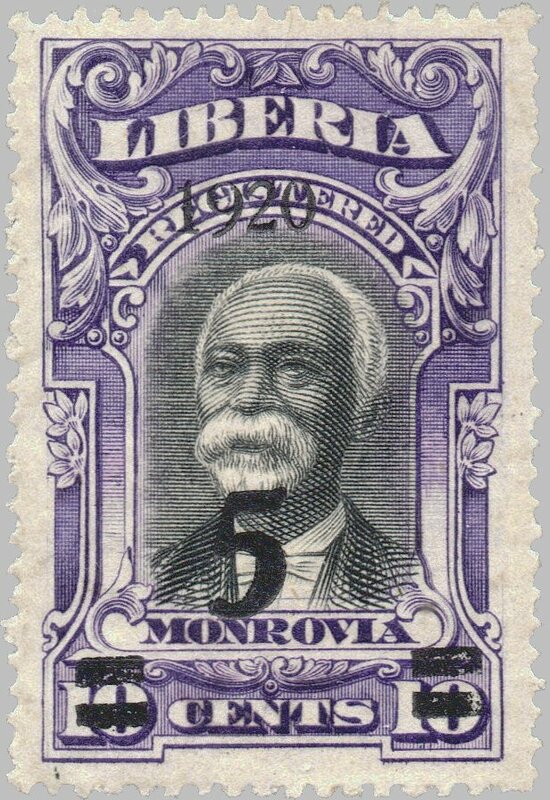 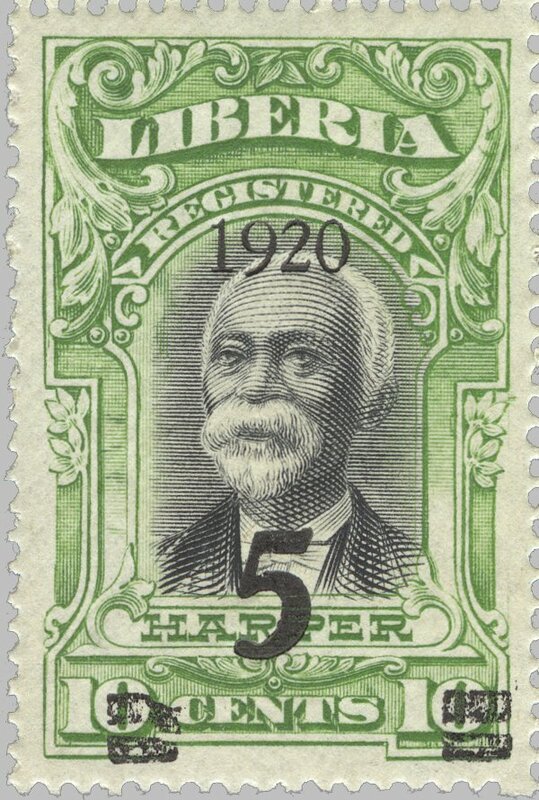 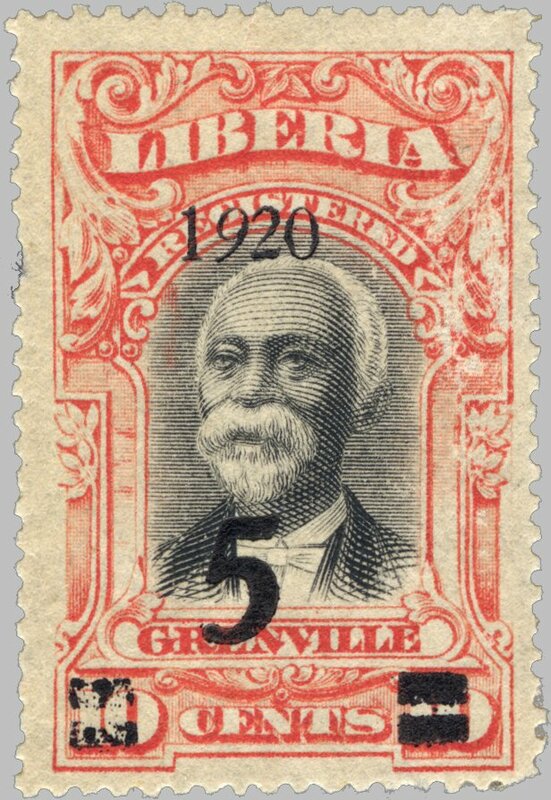 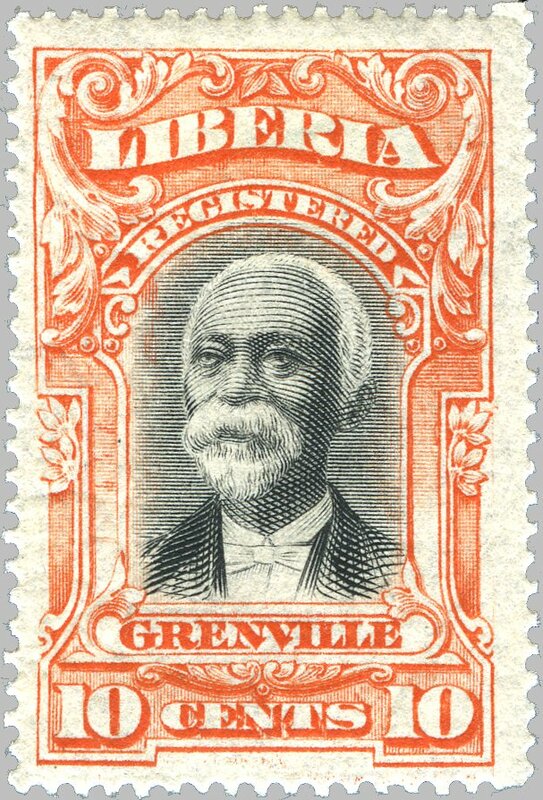 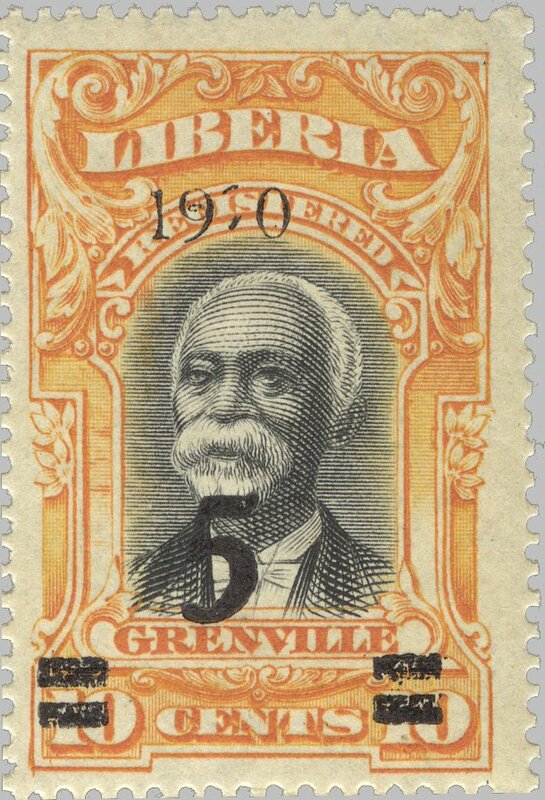 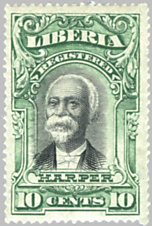 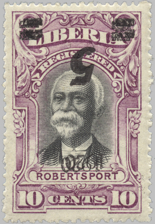 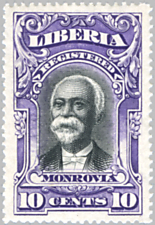 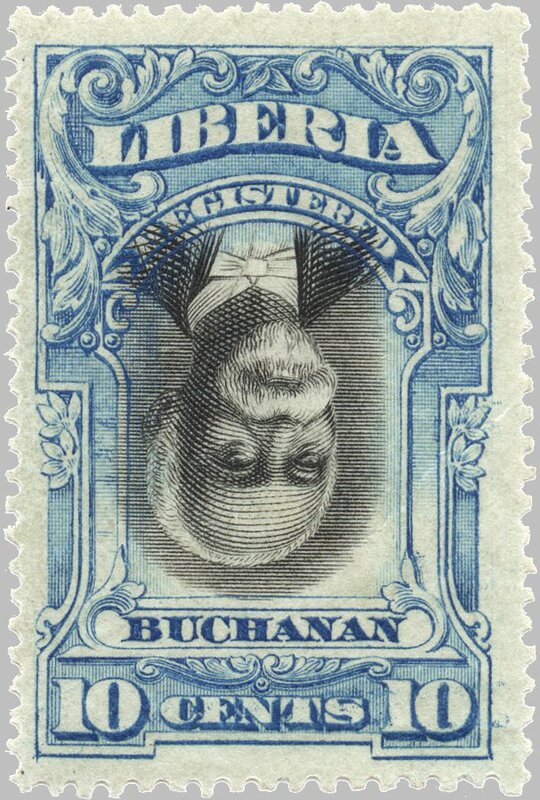 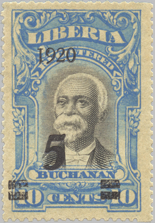 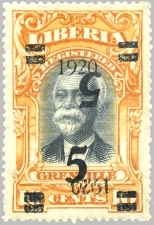 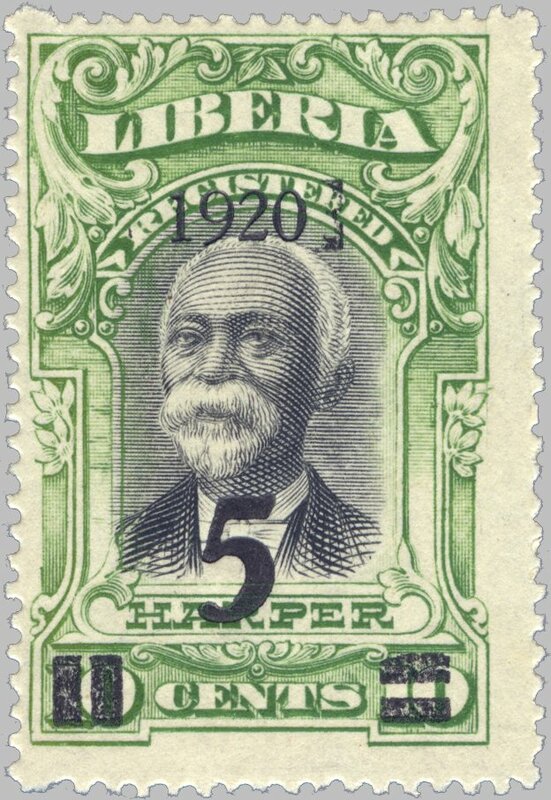 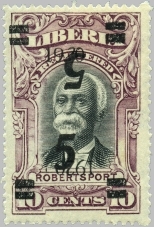 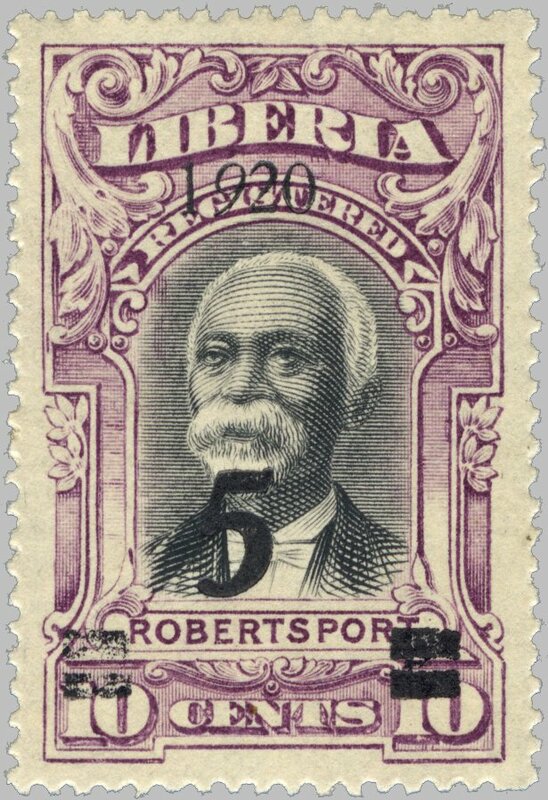 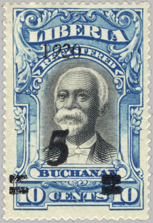 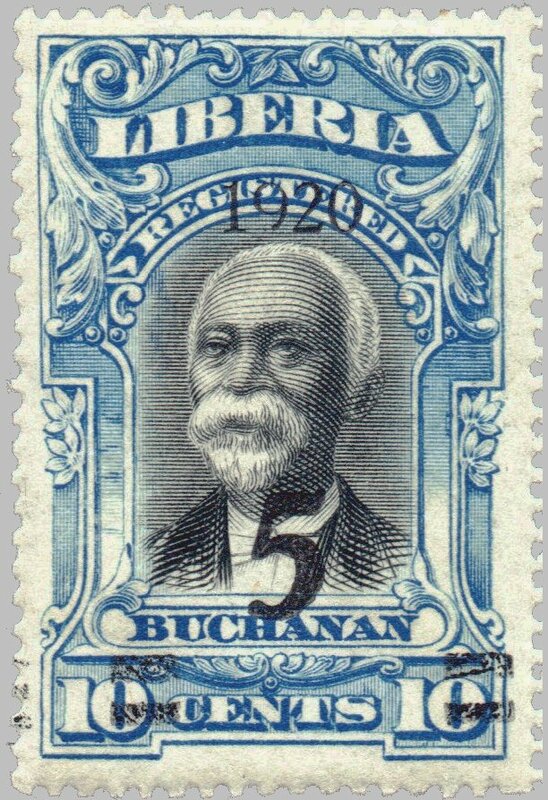 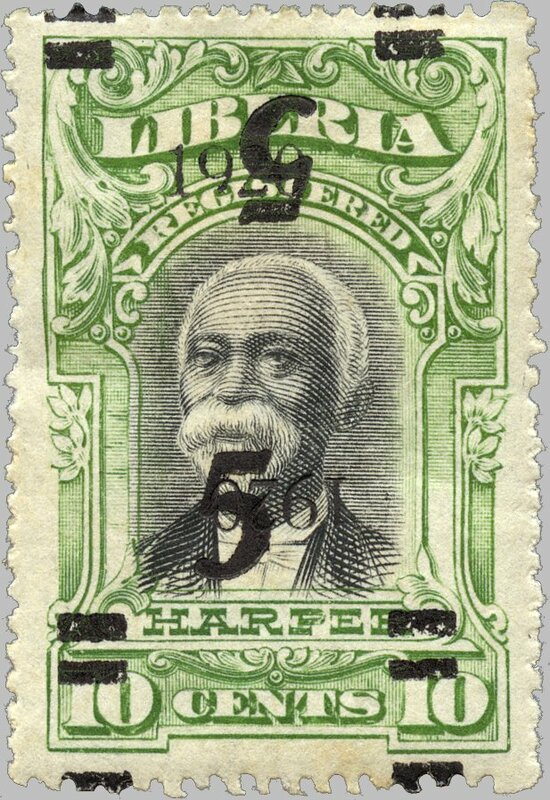 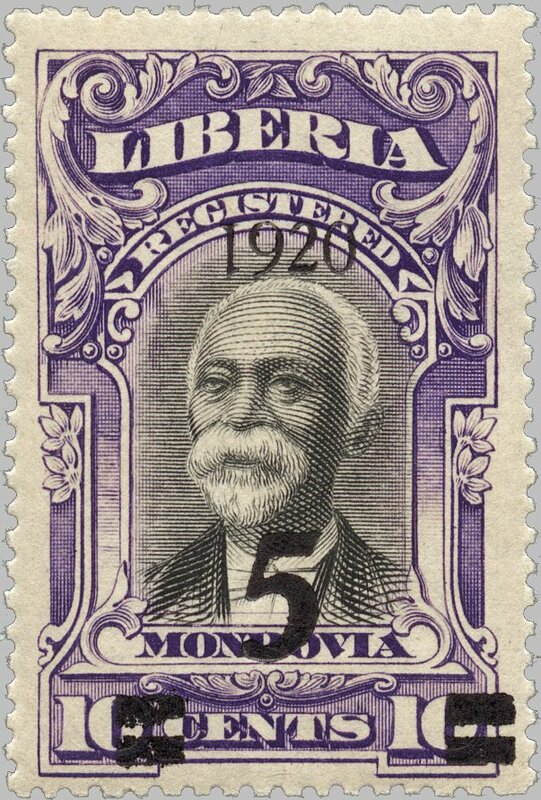 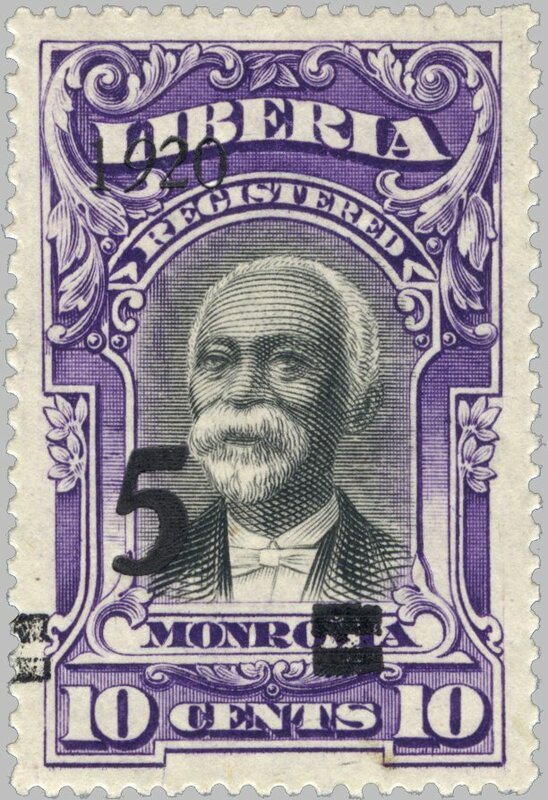 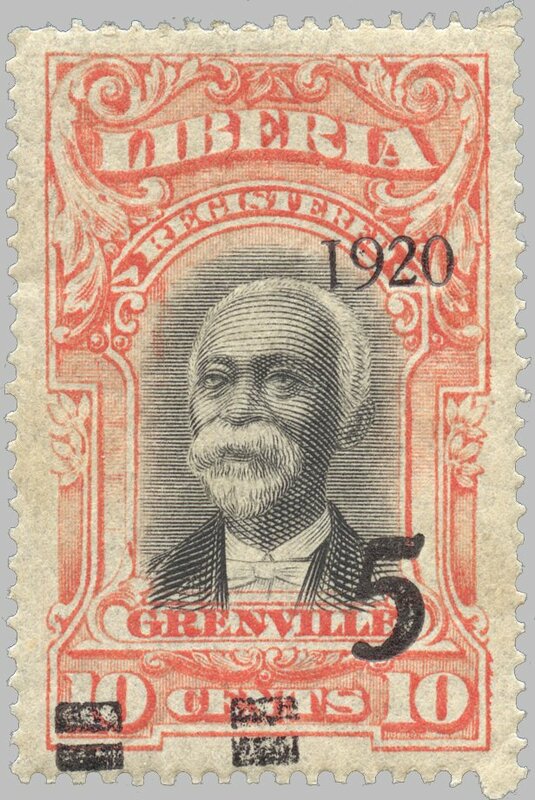 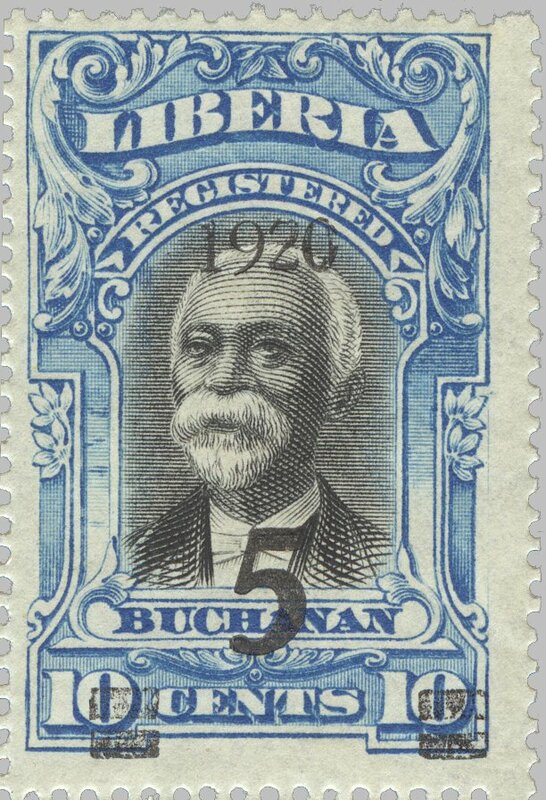 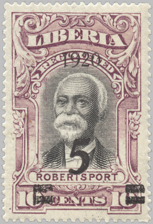 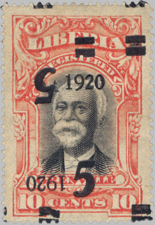 engraved by Perkins, Bacon & Company, England on unwatermarked paper, perforated 14.
overprinted in a setting of 25 twice on each sheet of 50 on all values for Buchanan, Grenville, Harper, Monrovia and Robertsport; major varieties are: inverted “1” in “1920” (position 13), italic “2” in “1920” (position 15), italic “9” in “1920” (position 20), and left quad bars vertical (position 22), all of which also exist in combination with the major errors: inverted overprint, double overprint, and double overprint with one inverted; also with hand stamped double quad obliterators on Buchanan and Robertsport; the typewritten surcharges were done on panes where the overprinting was very misplaced, and are only known for Buchanan, Grenville (orange red shade) and Harper either in violet and large lettering reading “1920 FIVE CENTS”, or in black and smaller lettering reading “FIVE” with some “X”s obliterating the old “10” values. 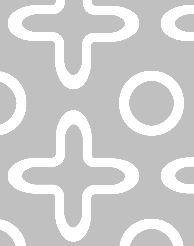 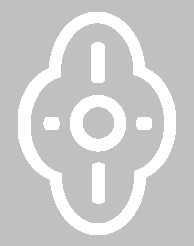 in principle, every single position except one (no. 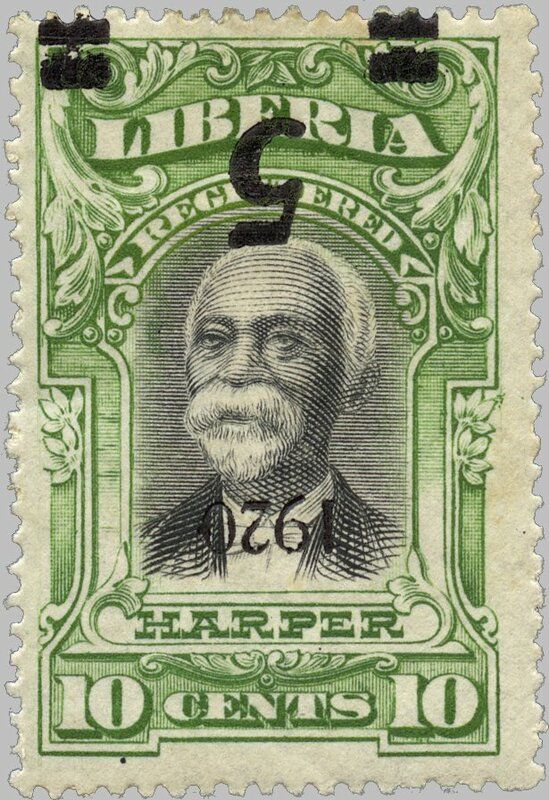 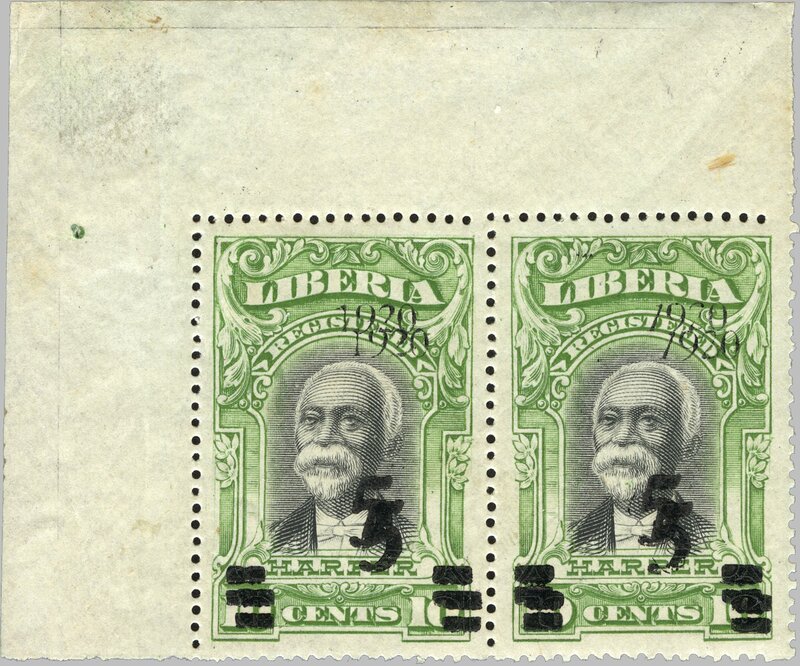 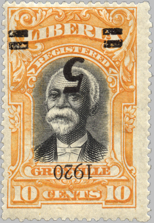 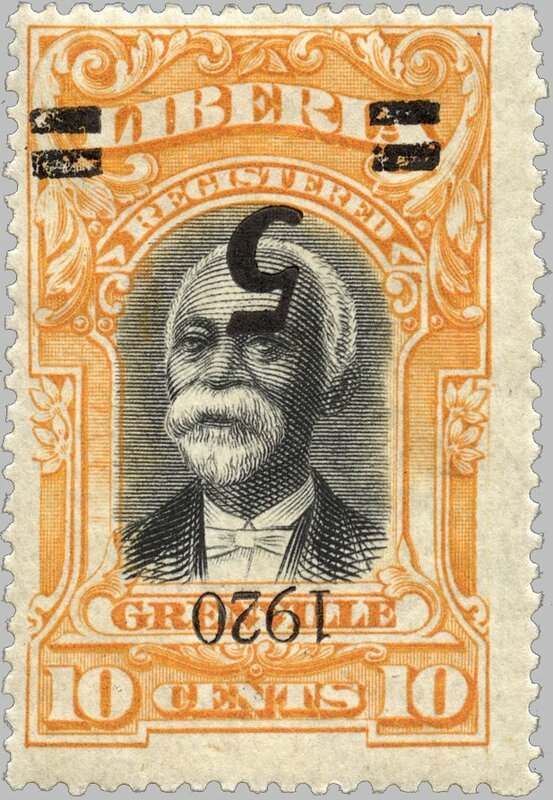 17) on the pane of 25 should be platable due to some fault or variation of type, but some of the flaws reported probably developed over time and are hardly visible on early printings.